In our new “Dispatches From the Road” feature, the KANE blog will periodically publish interviews with our drivers – the men and women who live and breathe the transportation topics we often write about. In our first segment, we interview KANE driver Don Brobst. I was camping years ago with a buddy of mine, and he was telling me about a job he got driving for local company. It sounded interesting so I checked it out. I started out as a yard jockey and, after a while, went out on the road. 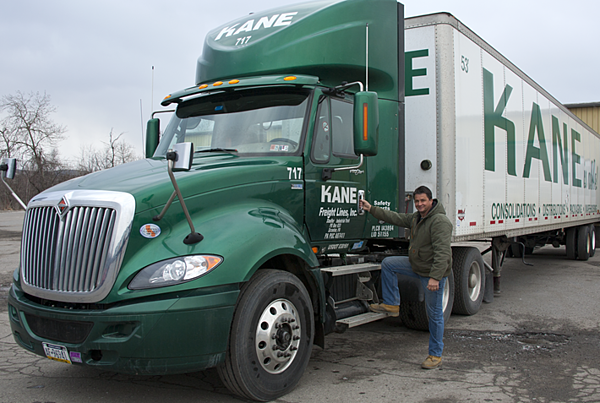 I’m a local driver, so I handle freight typically within a 50-mile radius of the Scranton, PA terminal. I have a good routine. I start around 6 am and I’m back daily. I used to go into New York City a lot, but no longer. That’s a good thing. It’s too crowded. Now, with the strict Hours of Service regulations, I’d be worried every day about getting held up and not having enough hours to get home. I love the freedom of being out on my own, without people watching over me. The main difference between a city driver like me and an LTL driver is that LTL drivers never know what they are going to get day-to-day. Sure, they get paid more per hour, but I would not take that trade-off. There is comfort and less stress in knowing the routes. Plus, I get to know my customer’s customers and how to get in and out of locations in the fastest, most efficient manner. That helps everyone. When everything happens at once – like at 2 pm on a Friday afternoon. Sometimes these spikes just can’t be avoided since consumer demand is hard to predict. So we try to be responsive to meet the needs of our customers. But it’s certainly better for drivers when the team can pre-plan for these volume spikes. What technologies do you use to make your job easier? Mobile phones are great. They eliminate uncertainty for directions and make it easy to connect with dispatch. How are you challenged by ELDs and the Hours of Service regulations? Actually, I love electronic logging devices. They keep track of everything so I don’t have to. On the flip side, ELDs can make the job stressful. The focus on safety is great, however drivers are becoming bounty on the roads. Many local police have become certified in the new regulations. That’s fine, but when they start taking a hard line on the rules just to punish drivers for minor infractions, it’s gone too far. Describe the worst consignee locations. Grocery warehouses are the worst, by far. Wait times can be outlandish, and they don’t seem to care about the impact of these waits on drivers’ schedules. And that applies from the time you enter the yard to unloading at the dock at the DC. I also do direct store deliveries and we see that same indifferent attitude, even at stores. It’s unfair. There are rules and requirements for drivers, and penalties for non-compliance, but what is the downside for retailers when they run behind schedule or lack the manpower to quickly unload a truck? Drivers are held to regulations, but grocery chains seem to write their own rules when it comes to receiving and processing inbound goods from suppliers. What’s the craziest thing that’s ever happened to you while on the job? Getting flashed during my trips to New York City – both men and women! Once I saw a tornado touch down near Giants Stadium on I-80. I bring a lunch most days. When you’re on the road, it’s easy to eat poorly. There’s unhealthy fast food off every exit. Over time, this can have a negative effect on your health. Also, as drivers, we’re not moving and exercising during the workday. Bad food and no exercise is not a great combination, so it’s important to at least eat right when we can. Any comments on the driver shortage in the logistics industry? It’s a generational thing. Young people don’t want to drive anymore. It’s not an easy job. I remember in the 1990s, when I started, there were very few cars on an interstate like I-380 in Northeast Pennsylvania. Now it can be jam packed, and that’s a different type of driving. Also, there is stress involved. As drivers, we’re hauling loads that bring total vehicle weight to 80,000 pounds, so we have a huge responsibility to drive safely. That’s an enormous amount of pressure. On top of that, when you also feel like you’re being hunted by the DOT, it adds another layer of stress. Don’t get me wrong. For the right person, a career behind the wheel can be a great match, but it’s a different job than when I first started. Drive locally and have a life. Find a reputable company that operates safely and where you feel like part of a team that cares about you.